If you aren't familiar with hazardous waste management, it could be due to the fact that this career is still a relatively new one compared to many other health careers. Starting in the 1970s, companies and the government became aware that there must be solid ways to solve many of our environmental woes. Once governments began to develop and enforce regulations, the need for chemists who could ensure companies would abide by these laws became an important one. Since that time, the area of hazardous waste management has grown tremendously. When people talk about hazardous waste, they are referring to a substance that can potentially harm human health or the environment if not managed correctly and safely. It's an issue around the world, which has driven the need for qualified professionals in the field. A chemist who works in this area has many exciting job prospects. They will be responsible to identify pollutants that could be in soil or perhaps in water or air. They also get to work in research to create better ways to manage these pollutants and protect human health and the environment. A typical day in this role will involve the use of your chemistry training to find out the composition of substances that are hazardous. As such, you can expect to work in a laboratory or perhaps be conducting field work as well. Once you have analysed a sample, you would then be determining how best to dispose of the substance and conduct an efficient, thorough cleaning of the contaminated site. The laboratory itself today is an advanced one and where in the past you may have been conducting a lengthy analysis, today there are machines to do much of the work. Your typical day could involve field work to collect a sample, laboratory work for analysis and an office environment for paperwork and determination of how to clean up the site. Your employer could be anyone from the government to academia or a chemical firm that specialises in this kind of analysis and work. Such companies are usually good places for career advancement as well, particularly as bench chemists can make the move to more managerial positions. Working hours can be very irregular. A toxic spill could happen at any time of the day, so you could be working very odd hours at times. However, for some people this is part of the thrill of the job and keeps things changing and challenging. Is it the Right Career Choice? If you're passionate about the environment, then you are an ideal candidate for a career in hazardous waste management. 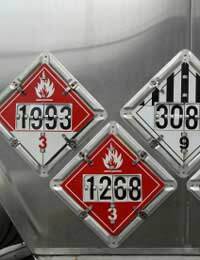 Attention to detail and lots of flexibility for the regular changes in government regulations around hazardous waste are important traits to have if you want to excel in this role. You should also be comfortable working in a team environment, plus possess excellent communications skills. The training for a career in this area is actually quite reasonable. While you don't necessarily need a postgraduate degree, you should typically have a bachelor's degree in chemistry. Your coursework would have a significant basis in organic, inorganic and analytical chemistry. You would also be studying geology and areas such as soil chemistry. Generally, a person with good analytical skills who excels in the sciences and maths will fare well in hazardous waste management. Familiarity and comfort using a wide range of computer applications will also be beneficial. Those employed in this career have a strong, stable job outlook for the future. As environmental concerns grow, more government money is being channelled into this important sector. Private companies are also following suit and there are a number of job opportunities in hazardous waste management today. If you enjoy chemistry and want to help the environment and public safety, then start considering a career in hazardous waste management.